Bob Linkenbach has been CEO of VIPA GmbH, located in Herzogenaurach, for more than a year now. 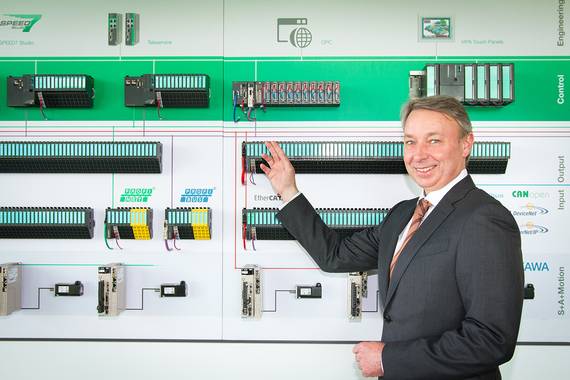 In an exclusive interview with the chief editor Joachim Vogl he describes how the company has developed from a supplier of Siemens compatible components to an independent solution supplier. 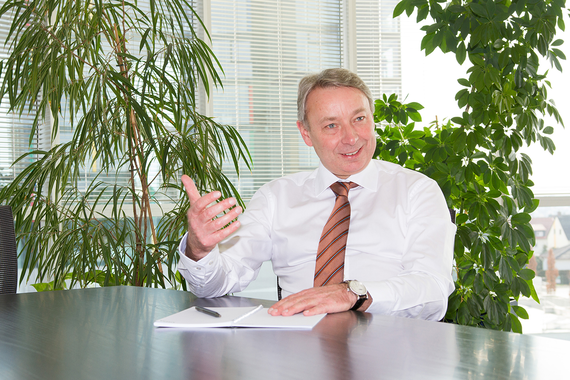 Joachim Vogl: Mr. Linkenbach, exactly one year ago you took over the operational management of VIPA GmbH. What are the changes you have been able to effect during this time? Linkenbach: The complete management of VIPA was restructured. We succeeded in effecting a smooth changeover from the old management to the new. A further important point was to retain the company culture during the change process. We did it! No employee left the company because of the acquisition or the management change and we are well-positioned for the future. The merger of VIPA and Yaskawa goes back four years now. How does this fact influence your daily tasks? For Yaskawa it was important from the very start that we retain the flexibility and innovation power of a German medium-sized company. This is still fact and ensures that we have the dynamics to develop customized solutions fast. The management was kept and a successor was found from within the company which is evidence of trust to the staff. So for most of the employees there were not many changes on the operational level. There is, of course, a very active exchange on the management level between VIPA and Yaskawa and we are working intensively together on a joint future strategy. Where are the synergy effects? We achieved synergy effects in the sales area very quickly by a common use of national and international sales channels and system partners. From the technical point of view we are becoming more and more an essential development center in the field of control outside of Japan – and on the product as well as on the ASIC level with our subsidiary profichip. Consequently, it ensures that the European demands on automation products are also implemented purposefully in our future technologies and products. How do these synergy effects affect products and solutions as well as the product portfolio? As there is no overlapping on the product level and as we cover the same market and customer segments we were able to compile a mutual product portfolio quite easily. To coordinate these products optimally and consolidate them to a solution which is easy to handle for the customer is the focus of our development and an important module of our strategy to move from a component to a system supplier. As the field of drive technology was quite a new field for us we specifically strengthened our staff for this purpose. There is an experienced team who supports customers with their applications in the field of drives, motion and control. This team delighted and convinced our customers very quickly about the solutions. The initial projects have already been implemented and are now bearing fruit. What are you going to present at the Hannover fair 2016? What are the highlights? What will the customer be excited about? In addition to the servo line Sigma 7 and the new VIPA PLC with integrated motion control iMC7 we are also presenting the new inverter series GA700. The new device generation GA700 is characterized by an especially easy handling and commissioning as well as its performance capability at high energy efficiency. Furthermore the Motologix function in the field of robotics may also be very interesting for the user. This allows direct control of up to four connected Yaskawa robots via Profinet by means of a VIPA SPEED7 PLC. Depending on the application, process programming is not required in the robot and this allows the person responsible for application planning to solve the automation task completely and continuously in the PLC. This is an interesting option for the mechanical and plant engineer with regard to more efficiency during the deployment of the existing resources. The benefits are obvious: The need for detail adjustments with regard to process and interface is reduced considerably and in addition programming and commissioning of the installation are combined and so very much simplified and shortened. Furthermore future tasks such as the implementation of customer demands or necessary services – whether via remote access or at the customer on site – concentrate mainly on the PLC controller and so they are easier to plan and implement. Your development tool SPEED7 Studio is designed for VIPA controllers, to increase their engineering efficiency and cost effectiveness in the world of automation. What are the next steps with regard to efficiency and cost effectiveness? For us the subject of cost effectiveness is defined by the amount of the conversion costs on a new engineering system and the efficiency and flexibility of the future benefit. The conversion cost is minimal for the target group of Simatic users, who are especially important for us. The user finds himself in a similarly structured engineering environment which allows him to import the existing programs and to use existing know-how, but which, nevertheless, offers a VIPA-like system open approach to the arising automation tasks, for example unique configuration of Profibus, Profinet and EtherCAT. The continuous and intuitive user guidance allows a trouble-free and fast access and also makes the engineering tool interesting for all new users. A further customer benefit with regard to efficiency and cost effectiveness is achieved by the extensive CAM functions in the field of motion, debugging, test, and simulation options, both for the controller and the HMI, as well as, in the future, by the increased implementation of high level language and object oriented programming. System open and defined interfaces allow an easy integration of the products of other manufacturers in order in the future to offer further functions beside the programming, configuration, visualization, and motion. How much is Siemens still included in VIPA products? Our products have always been seen as a supplement and extension of the application options. That will remain unchanged. For this reason we have now completely revised our controller 300S+ and made our system 200V compatible to TIA. Our new PLC systems for the lower and middle performance area will still remain software compatible. The moment that we can't create additional benefits by compatibility any more, we will go our own way. Customers who want to keep up the software compatibility can still do that. This is also possible - as previously mentioned - for the new PLC systems which we are developing right now. We offer a tailored tool with our engineering platform SPEED7 Studio for users who want to deploy VIPA and Yaskawa products not only as components but also as solution systems. There we deliberately left the path of compatibility. With our platform the user saves considerable engineering costs and programming time by using VIPA and Yaskawa components since programs that are written with Siemens Step7 can be imported. This considerably reduces conversion time and the existing know-how can still be used. We will provide our engineering platform to our customers during this year. What makes VIPA different compared with its competitors? How does VIPA define itself from a technical point of view? We are working on a completely new PLC device generation with its own formal language based on a new open Multi-Core-ASICs generation by our subsidiary profichip. During the development the focus is on processing speed, support of different fieldbus systems and networking, connection to BDE/MES and ERP systems, and the easy commissioning and diagnosis. We are also considering software compatibility but only as long as there is an additional benefit for the customer – as I already mentioned previously. With the openness of the new system and our engineering tool SPEED7 Studio we are going to create a platform that also covers future demands on control technology. The field of robotics is booming. What does this mean for your company? Yaskawa is world market leader in robotics and drive technology and we are an integral part of Yaskawa. So this subject has also a very high priority for us. We are working on solutions that provide data for the operation and for diagnosis of the robots by means of pre-assembled templates and modules via the control panel of the machine. The function to control the PLC via the robot by using Motologix will be further expanded. On the technological side we are working on the integration of controller tasks, robot operation, and drive technology. With this we are giving those customers, who are looking for a complete solution, an option to save engineering costs. Here particularly we definitely see an additional benefit which only can be provided by Yaskawa. What does the strategic further development of VIPA look like? Where do you see the company in 5 to 10 years? From the technological point of view we are advancing from a Siemens-compatible supplier of components to an independent supplier of solutions. This process covers the whole company and will continue in the coming years. During this process we will gradually integrate into Yaskawa. The aim is to present ourselves as a whole company to the customer and on the market with strong roots in Europe and as a company of complete automation to supply the best solution for each application.